I hope you join us again this week. Last week's entries to our 'Tree Decoration' theme were amazing! All so varied and beautiful! You wonderful ladies have given me so much inspiration, it's fantastic! The gorgeous flowers I've made for this card were a direct copy of those Sara made and used on her card Here. Love this image, so cute. I might have to take up stamping, so many lovely images. . .
this is gorgeous, love this image snow much fun hehe, and gorgeous bold colours. This is such a cute, fun card. I love the colours and those punched flowers are perfect. Teri I just love this Elzybells image! You have such beautiful cards! Thank-you for the comment you left on my blog! 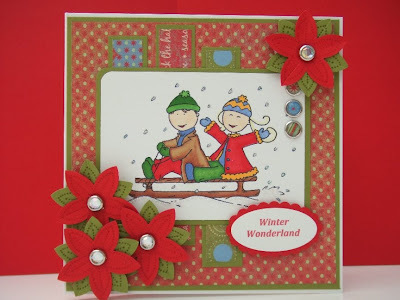 aww Teri what a fun card, love those bold colors and those flowers...ADORABLE CREATION! 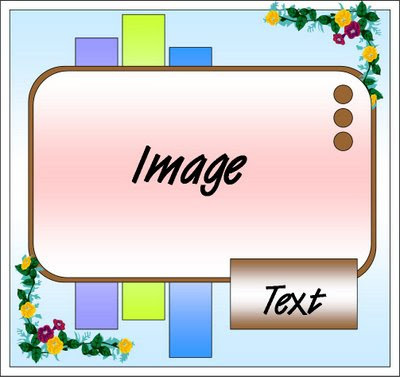 a wonderful card, love the fun image that you have used. Oh this is fabulous, love the sweet image and perfect christmas colours. what a fun card. and the colors are all perfect. Love the image you used. Anyone who receives this will be smiling ear to ear. Got a little something for ya on my blog. . .
Just been doing a major catch-up with your blog, Teri - so many fab cards you've made! I really like this sketch, I'll be using it soon I think! This is such a great card Teri! Love the colours and the image is just adorable! Thanks for leaving such a nice comment on my blog! ps. I used to live in Frome - but now in Canada! You did a beautiful job with this sketch Teri. such an adorable card. Gorgeous card...the image is adorable.